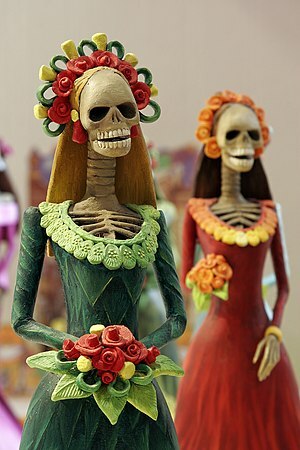 Image via Wikipedia ~ La Catrina ~ She is often a symbol of Day of the Dead festivities. Here it is – October already – and our minds naturally turn to celebrations of harvest, Yom Kippur, Halloween, or Thanksgiving. For me, it all starts with baking loaves of pumpkin mesquite bread! I’m adding one of my favorite holidays to the autumnal mix: Dia de los Muertos. For those of you who may already be enthusiasts or who are just now learning about this holiday, I’m excited to share ideas and resources with you. Since I practice funeral celebrancy in the southwest and live in Tucson, I pay a lot of attention to rites, rituals and celebrations about death. I am fortunate beyond belief to live near the rich traditions of Mexico, where celebrating the Day of the Dead is central to many family and community traditions. In Tucson, we experience the holiday to various degrees. Dia de los Muertos is a holiday of remembrance, but it is not one full of sorrow . . . it is very much about celebrating life and offering thanks to those whom we have loved. Altar building ~ creating a doorway where the lands of living and dead can symbolically meet. Food offerings and candlelight vigils ~ at the altars and in the cemeteries within a community. Candy skulls ~ Calaveras made from sugar mostly – or chocolate sometimes – decorate the altars and are loved by children especially. Flowers ~ garlands of marigolds and other specialty flowers of gold and orange become beautiful decorations for altars and cemeteries. This is just the tip of the iceberg, really! Let me know how you’ve experienced Day of the Dead . . . and if you’ve noticed yourself celebrating life in the midst of doing so.